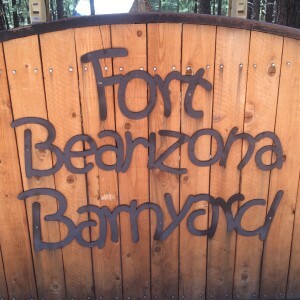 Bearizona was amazing this past Saturday! We were taking guests, and got a late start. With increasingly hotter weather, I was concerned the bears would not be very active. Fortunately, I was wrong. The bears were great. We arrived about 8:45 a.m. and headed straight for the baby bears in the walk through section who were absolutely adorable! They were eating and were totally involved in their food bowl. 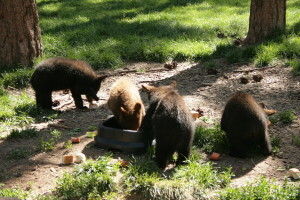 It was on top of them and under them with food spread all around – just the way babies like to eat. Too cute! One could watch them for hours with their hilariously entertaining antics! 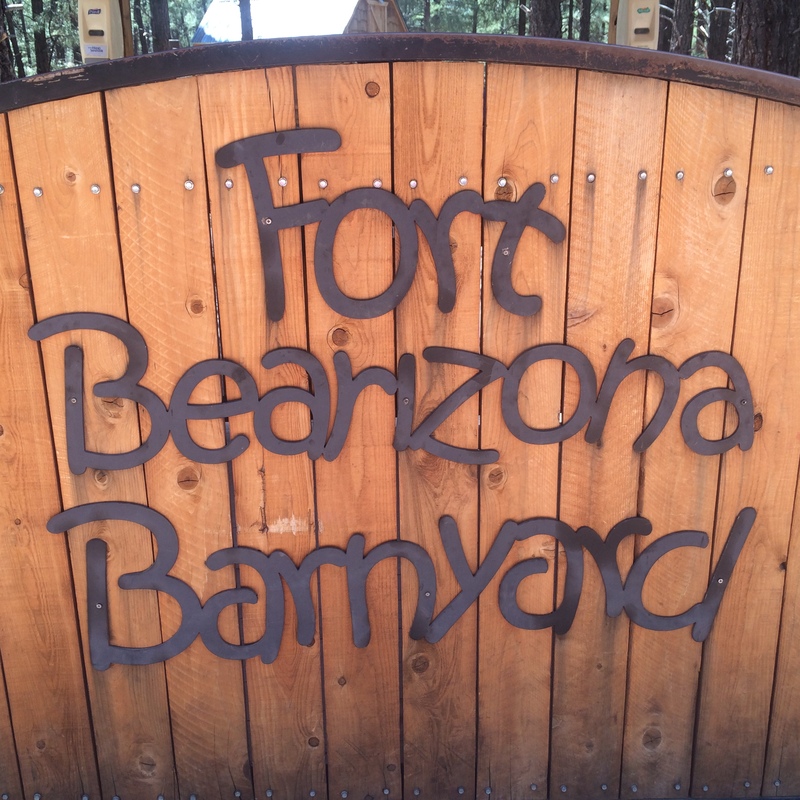 This Bearizona adventure is divided into two sections – the drive through section and the walk through section. Both are a bus load of fun! I recommend getting there when the gate opens at 8 a.m. and heading straight for the baby bear cubs in the walk through section. Sometimes you can watch their morning breakfast. These adorable babies will launch out of their den like a furry cannonball to be the first to the food bowl. Watching these curious critters with their Cub Keeper can be hilarious! The cubs get kind of attached to those who feed them and want to play with them and chew on their shoes and clothes, etc. – kind of like a puppy who can’t stop chewing, eating and playing. 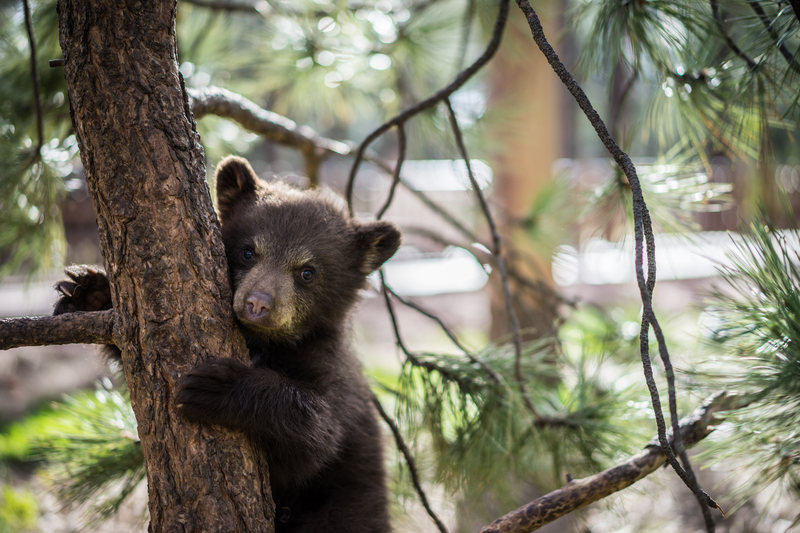 Many times the cubs come right up to the edge to look at you, sniff the air and make baby bear noises that sound much like a baby crying. If there is a loud noise or someone claps their hands, these babies will high tail it up a tree faster than you can say, “Bearizona”! At 9:40 a.m. a park attendant will give a Bear talk. It was at one of these talks that I learned that when a bear is born it is only the size of a stick of butter and that baby bears grow very fast on their mother’s rich milk. At 10 a.m. is one of the bus rides through the drive through section of the park. I used to only drive my car through until I rode the bus. What a fun ride! The bus drivers act as your guides and tell you all about the animals and the park. I learned fascinating information about how Bearizona is committed to conservation. They take old cars and buses and use them as the basis for their rock walls and cliffs that they build around the park for the animal exhibits and homes. 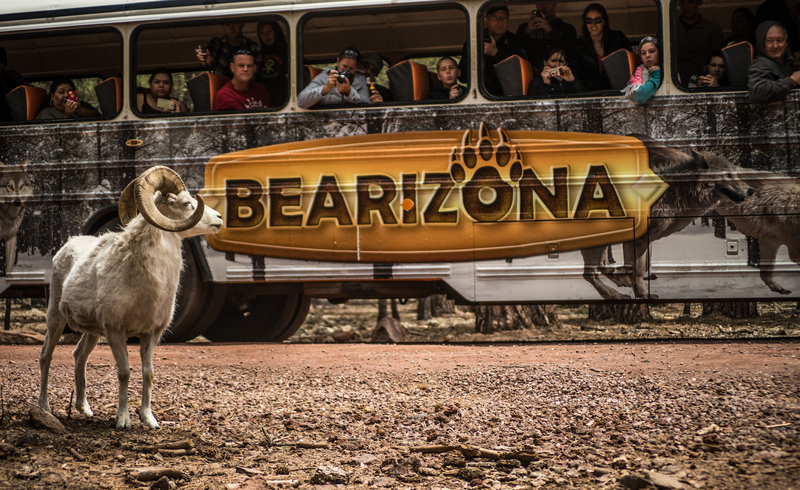 The bus guides also throw food out the windows so the animals come right up to the bus for amazing animal photo ops that get a little up close and personal. 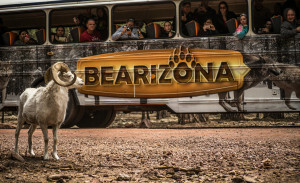 Here is a list of some of the other animals at Bearizona: Rocky Mountain Goats, Dall Sheep, American Burros, Bison (weighing up to 2,ooo lbs), Alaskan Tundra & Arctic Wolves, White Bison, Big Horn Sheep and of course the comical Black Bears of North America. At 11:00 a.m. is one of the High Country Raptor free flight bird shows (This will be one of our future blog articles.) WOW! I had NO idea! These birds are amazing! They fly right over our heads using us for lift. The trainers share their bird facts and experiences involving the audience in creative ways throughout their talk. Once this is over, you must hurry to the otter river. 11:40 a.m. is the Otter Feeding. What playful animals otters are. The trainers let you feed them fish and talk to us about interesting otter facts. Too much FUN! The otters are like the baby bear cubs – you just cannot get enough! Bearizona also has a well-shaded picnic area inside the walk through area where we like to bring our picnic lunch and eat while watching the animals. A food concession is also inside the park to meet your hunger and thirst needs. Shopping? Of course! 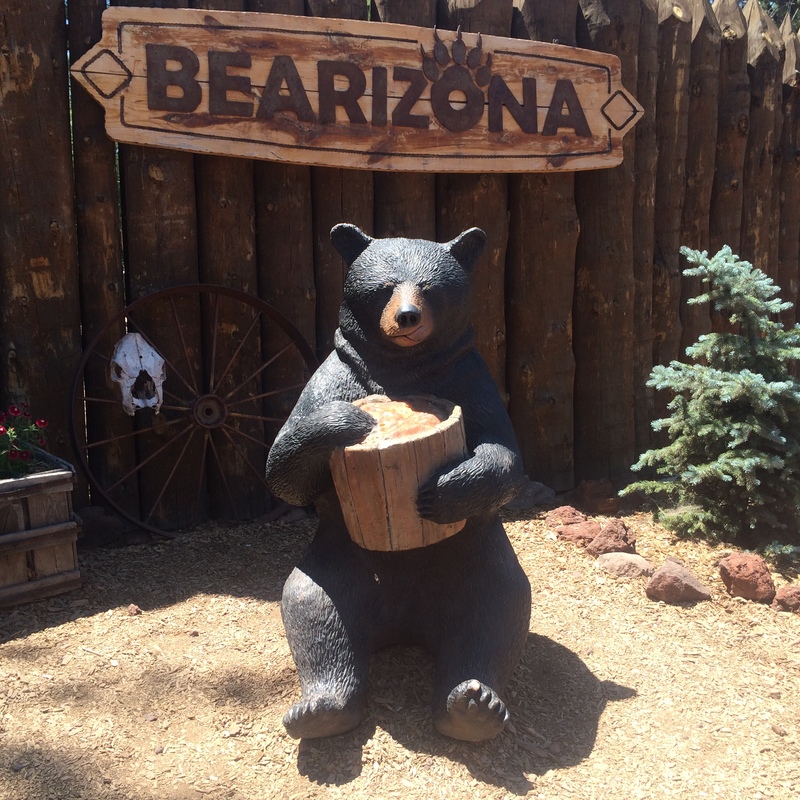 Bearizona has a new large Souvenir Store that you won’t want to miss. Before you leave the park, you must stop to see the Kindergarten bears which are last years baby cubs, the foxes and badger and visit the Bearizona Barnyard petting zoo. 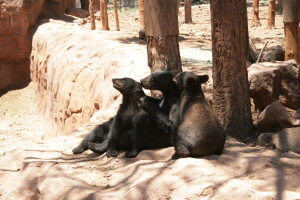 Last but not least you must check out the baby bear cubs one last time. You will probably find them up in a tree taking a nap! When you go, I hope you have as much fun as I do at Bearizona. It is truly an animal adventure you don’t want to miss! Be sure and tell them that Team Tait sent you. 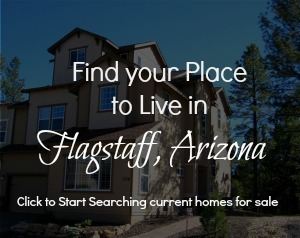 Posted in Adventures, Places to Play and tagged Fun in Flagstaff, Things to Do.